Nokia India is now on Orkut and to all those out there who still use the Social Networking website, head out and join them here. 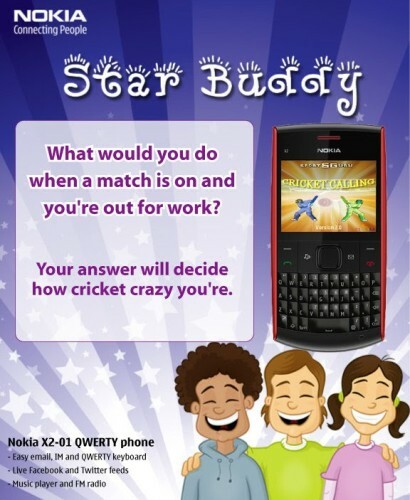 There’s also a small contest running called the Nokia Star Buddy Contest. If you’re on Orkut and interested in cricket, do participate in the contest here. The contest is pretty easy to play and if you’re a cricket fan and love discussions and arguments amongst groups, chances of winning the Nokia X2-01 is really high! Every week, Nokia India asks 3 questions, inviting people to share their thoughts. The post with maximum comments stands a chance to win a brand new Nokia X2-01, so that’s a Nokia phone every week! Also, here are a few cricket games if you already own a Nokia X2-01, planning on purchasing one or win one of these! But make sure you go through the Terms & Conditions at http://bit.ly/leHbX2 before playing!